This article walks you through How to Use and Install Tabs Outliner Chrome Extension. If you’re like me and you have a ridiculous number of Google Chrome tabs open at pretty much any given time, then you’ll love this extension. What does Tabs Outliner Do? The free Tabs Outliner Google Chrome browser extension de-mystifies your Google Chrome tabs. You might call it a Chrome Tab Manager. Tabs Outliner puts all your Google Chrome tabs (or “open pages”) into one “page” in a horizontal, tree-style format. Furthermore, Tabs Outliner displays the full name of every single tab you have open (no more guessing a tab name just from the few characters that appear!). In the example below, you see I have way too many browser tabs open (20 to be exact), causing the Titles of the tabs to be cut off after about 6 characters. This leaves me confused and wondering what’s really in that tab that (in the screenshot below) says “andro”-something.. These Google Chrome tabs say “Add..”, “retro..”, and “andro..” – pretty cryptic, right? Fix it now. Now, you can see the full “Title” of every page you have open in Google Chrome. + Tab management BUTTONS: Tabs Outliner also gives you buttons for each tab to maximize your control over your Chrome browsing experience.. But this is just the tip of the iceberg for Tabs Outliner Chrome Extension’s list of features. For example, you can close a tab with 1 click and have Tabs Outliner auto-save a link to it in the tree for later use. Or you can rearrange and close tabs using drag-and-drop with Tabs Outline. Even just the basic features of TabsOutliner have already changed the way I use Chrome (which is hugely important to me), so check it out with the guide below and get started managing your Chrome tabs! 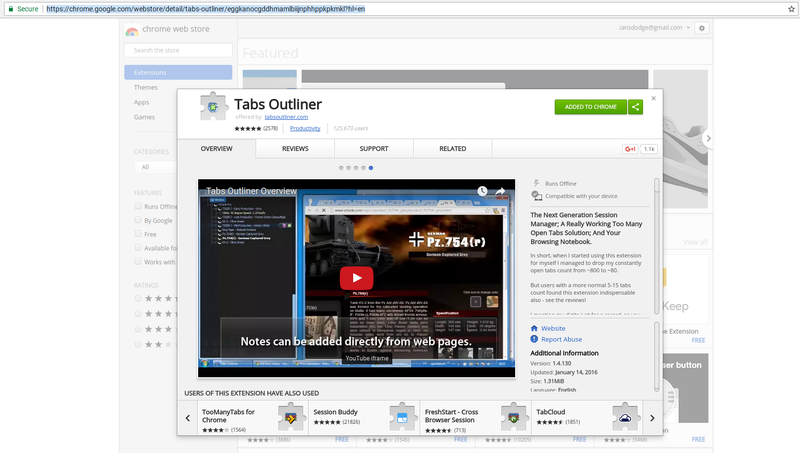 Go to the Tabs Outliner Chrome Extension page (here) in the Google Chrome Extensions webstore. When it’s done, notice how a small popup notification appears in Chrome telling you the Extension is now installed. Now, click the Tabs Outliner icon in Google Chrome to launch the Tabs Outliner Extension. Manage your tabs by using the three buttons that appear over each tab listing when you hover your mouse over each one. Or drag-and-drop tabs to re-order them in the “tree list”. Additionally you can drag-and-drop links and parts of web pages and websites into the Tabs Outliner tree view to quickly add new items. Enjoy total control of your Chrome tabs! Tabs Outliner Extension for Android & iOS? Note: The mobile version of Chrome does not support installing Extensions, so the Tabs Outliner Chrome Extension will only work on non-mobile devices such as PCs, laptops, Linux computers, and Mac computers. Basically, mobile devices don’t handle Google Chrome Extensions the same way our PC web browsers do.